When his parents are killed in a car crash, Detroit teen Hank Goodman finds himself in the last place on Earth he ever wanted to be: Crosscut, Louisiana. Quickly tiring of the place and his aging grandparents, all Hank can think about is leaving. Until he meets the beautiful Becky Rayburn. Hank starts to settle in and just when things seem to finally be going his way, he is hit with even more bad news. Devastated, he accepts a visiting uncle's invitation to come and live with him in Colorado. 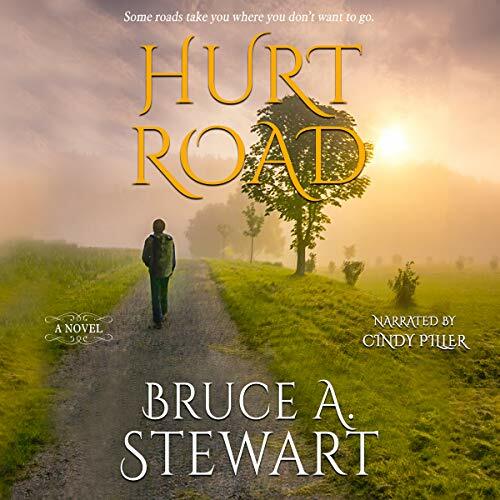 The family farm on Hurt Road, where teenage Hank Goodman is sent following the death of his parents, is the place on which Hank's life hinges.Though he'll leave for an extended time, the love of his simple, hardworking grandparents and pretty Becky Rayburn will draw him back. The little house in small-town Louisiana is the place where Hank both matures and falls in love. Likable characters, light romance, and some suspense in a fairly simple yet enjoyable story. Narration is professional and well done, always enhancing and not distracting from the story. This is my first experience with this author but it did not disappoint. The characters were well rounded and with the exception of the "bad guy" were lovable. Overall, it was a very sweet story but there was some plot twists thrown in to keep you listening when you should've been going to bed. The thing that I appreciate the most was that it was a "clean" book that you could listen to without feeling like you needed to shower afterward. Thank you Mr. Stewart for giving us something we could listen to and enjoy without sacrificing our values!! This is my first book by author Bruce A Stewart. I will gladly grab more. I enjoyed the characters and the overall story. We meet a young boy who is about to have his life turned upside down. We follow him into adulthood and the lessons he's learned along the way. Hank Goodman learns what family means and eventually comes to appreciate the one who's been right by his side the entire journey. This story has love, loss, mystery and overall great storytelling. This title was under Inspirational Fiction. It didn't disappoint. Narrator Cindy Piller was very pleasant to listen to. She is clear and articulate. Her storytelling style was a perfect fit for this title. I found myself immediately whisked into the story and anticipated the next opportunity to listen. Thank you for a wonderful listening experience. I received a free copy of this audiobook. My review is voluntarily offered. this was a great book that I recieved to review for free. narrator was not as good as she could have been but it was good enough. I enjoyed this audiobook at the very beginning to the end. I loved Hank and the loss he went through at such a young age broke my heart. A small town setting for most of the story and most of the people were nice. But you know you always have a bad apple in the bunch and he was bad. This was a clean story and that’s always a plus with me because I don’t read filthy books. Thanks Mr Bruce Stewart for writing an interesting story about life, love, family and faith. I would definitely read another book by this author. I received a complimentary audiobook by Audiobook Boom. All opinions are my own.